Last weekend Karol and I finished the staining and sealing the crib. 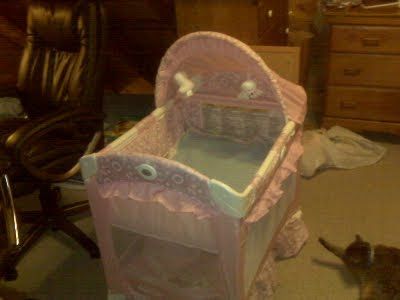 It's the same crib that Tim and then Andy used. The little pink bassinette is the perfect size for newborn Holly. The top bassinette part can be removed so that later it can be a travel crib when she's older. There is also a stroller/car seat travel system, and bag after bag of baby clothes. !